Drop, cover and hold was just the beginning for a drill at Sunnyside Environmental K-8 School last Wednesday. It's a sad fact of life that K-12 students must practice for calamities such as earthquakes, fires, lockdowns or active shooters. Now a few public schools in the Pacific Northwest are roping in parents and guardians to practice for the aftermath. These public schools are holding a relatively new kind of drill, a reunification exercise. State laws mandate school emergency plans, but an all-hands-on-deck drill for getting kids back with their families is not required. "Hopefully as we practice this, it becomes innate and the calmness and the routines become innate and we would incorporate that calmness into a real disaster, " said Portland's Sunnyside Environmental K-8 School assistant principal Alix Pickett. Sunnyside K-8 is one of the small number of schools to organize a reunification drill voluntarily. Pickett said it was important to have parents participate in the drill, even if it had to happen during the workday. The scenario that unfolded at Sunnyside last Wednesday began with a traditional earthquake drill. In teacher Jeremy Thomas' fourth grade classroom, the intercom crackled to life with a recorded rumble. "Drop, cover and hold on tight!" Thomas commanded as his students dived under tables. A minute later, the fire alarms throughout the school began to blare. The entire school evacuated onto the sunny playground where the teachers then called roll to make sure everyone got out safely. Teacher Jeremy Thomas holds up an all-accounted-for sign after the school evacuation. Normally, that would be the end of the drill. It's the point where many schools and some businesses will wrap up during the regionwide Great ShakeOut earthquake drill this Thursday. But Sunnyside took things one step further by asking parents or relatives for all 600-plus students to come to the school to practice family reunification procedures. This is not as simple as you might think. "We want to make sure when kids are being picked up that we're checking them off and we know, so nobody goes missing," Thomas explained. "When you have parents randomly coming on the grounds, we don't who is coming and going. Trying to keep it as orderly as possible is the key here." The line of arriving parents stretched down the block and around the corner. They could see the evacuated students across the playfield, but a low fence and yellow caution tape kept them at a distance. School staff checked the photo IDs of the adults and cross-referenced names with pick-up permission lists. Middle school runners summoned classmates one by one. Another ID verification happened before check out. Parents waited patiently in a long line while school officials recorded the release of every child after the mock emergency. Given the earthquake scenario, the multi-step reunification process happened without electricity, computers or cell phones — meaning lots of paper forms had to be filled out and pre-printed lists consulted. Eighth grader Parker Myrus wondered if the patience on display this day would last under duress. "It's good to have it well-rehearsed, but I'm not sure how much restraint the parents would be able to have if there was a real earthquake," Myrus said while he waited for his release. Parker's mother Holly said she took off from work early to pick up her son and his fifth-grade sister. Students Parker and Lucinda Myrus reunited with their mother Holly after she presented the proper forms and picture ID. "I think this is fantastic because if there actually was an emergency, I think having gone through it at least this one time will make your nerves settle a little more," Holly Myrus said in a later interview. Parent volunteers on a school safety committee pushed this school to do a full-scale reunification drill. 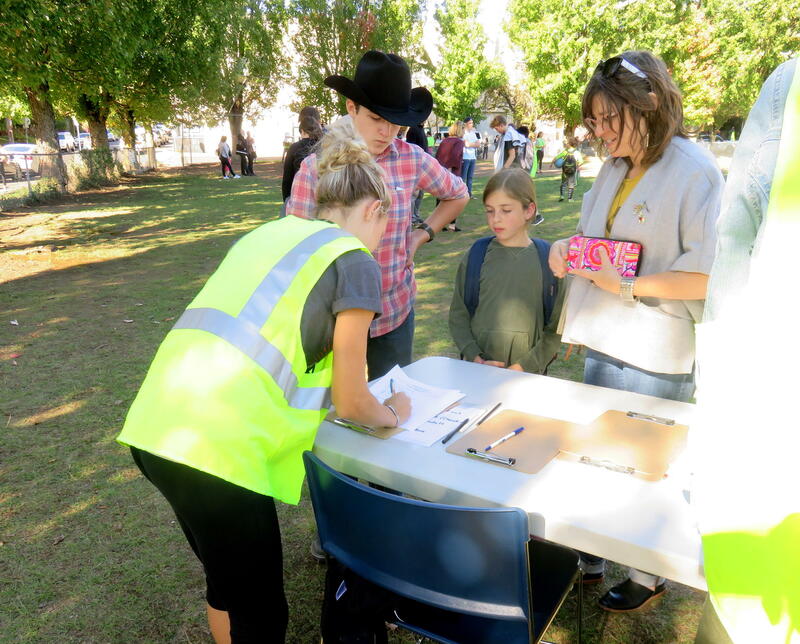 "We wanted the parents to think about how they would reunify with their kids in an event of an earthquake in particular and to think about employing their emergency contacts to pick up the kids," said Holly Cook, one of those volunteers. Some other school districts that have held scaled-down family reunification drills include rural Stanfield in northeastern Oregon and Everett, Washington. West of Portland, the Hillsboro School District organized a drill with volunteer actors playing the parents, some of whom grew agitated when they couldn't get to their kids right away. These exercises took months of planning to pull off. "We would love to have all of our schools do reunifications drills," said Portland Public Schools emergency manager Molly Emmons, after observing the Sunnyside school exercise. "That is certainly our goal." In Utah, the state Board of Education this summer considered making such drills mandatory, but eventually backed down. Board members expressed appreciation for a proposal to require each Utah school to hold one reunification drill per year beginning in the 2019-20 school year, but a majority of board members decided they did not wish to dictate this kind of drill. The co-founder of the Portland-based group Parents 4 Preparedness said she would like to see reunification drills be institutionalized as a requirement in the Pacific Northwest. In an email in which she said she was speaking just for herself, Laura Hall acknowledged there are capacity issues that may prevent this from becoming a reality. "Schools are already stretched to the max trying to meet standards, deal with equity issues, and solve other health and safety problems," Hall said. "Schools don't need to do reunification drills yearly - they could do them every 2-3 years." Hall plans to discuss the drill issue specifically and other aspects of earthquake safety at the annual Oregon School Board Association conference in Portland next month. Have You Planned For Number 2 After The Big One? Horror tales from recent earthquakes overseas are moving people in Seattle, Portland and along the Pacific Northwest coast to give a crap about where to crap after a major earthquake. It's not something we typically discuss in polite company, but disaster planners say that when water and sewage service fails, finding a place to poop is a big deal. After years of debate, the Portland City Council on Wednesday took a big step towards making the city’s old brick buildings more earthquake-safe.